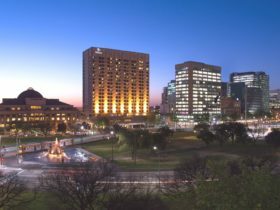 Combining convenience with style, Mantra Hindmarsh Square is the ideal base for business or leisure travellers, offering a central location close to all major city attractions. Guests have a choice of modern studios, one and two bedroom air-conditioned suites, which come fully equipped with a kitchenette, bathroom and laundry facilities. 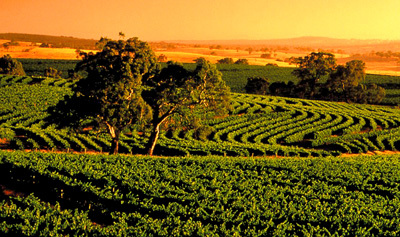 Some suites also offer a private balcony with views across Adelaide city or out across the majestic Adelaide Hills. 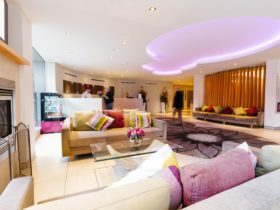 Mantra Hindmarsh Square’s professional and friendly team ensure guests enjoy a comfortable, relaxing stay. 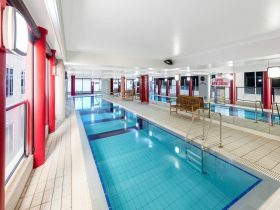 The hotel offers a range of guest facilities, including 24 hour room service and a 24 hour reception desk for convenience. SQ Restaurant and Lounge Bar offers creative cuisine featuring the best of local South Australian produce and is open daily for breakfast, lunch and dinner. 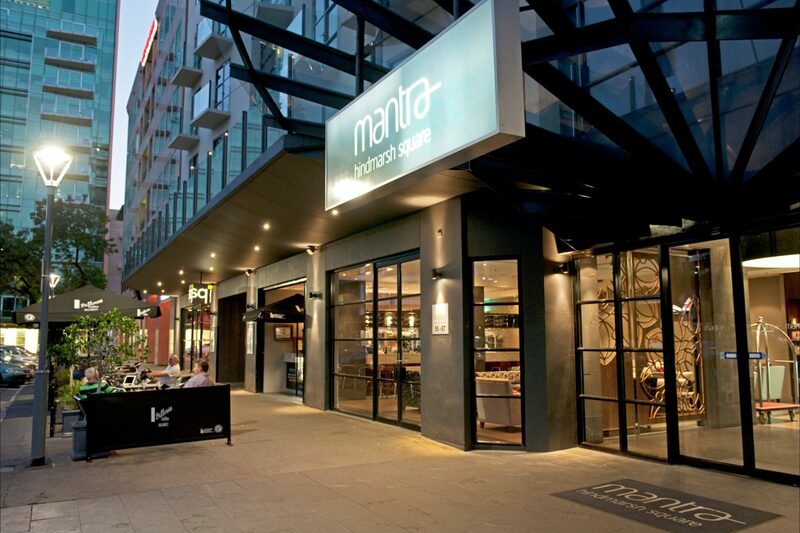 Located in Adelaide’s central business district, Mantra Hindmarsh Square is only a short stroll from the Rundle Mall shopping and Rundle Street dining precinct. 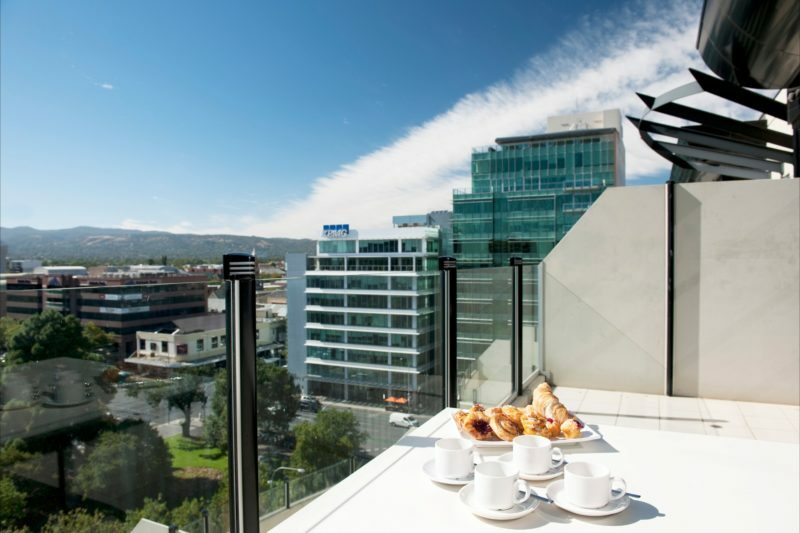 Boasting sweeping park views and modern and contemporary decor our Parkview Suite guarantees a relaxed and memorable stay with delightful views of the Adelaide City, only moments away from an array of shopping, restaurants and the central business district. Apartments are spacious and well-appointed with modern amenities and rooms boasting stunning views of the city and the Adelaide Hills. The modern Parkview suite offers a kitchen with dedicated lounge and dining area ideal for up to four guests. The Studio rooms offer the perfect accommodation for spacious and relaxed living. One of the largest studios in town offering 45 square metres in space, featuring queen size bed, modern living and dining area and kitchenette facilities. 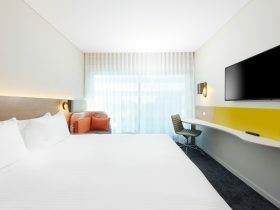 Mantra Hindmarsh Square is the perfect option for leisure or business travellers, combining the freedom and comfort of a cosmopolitan all suite living environment. 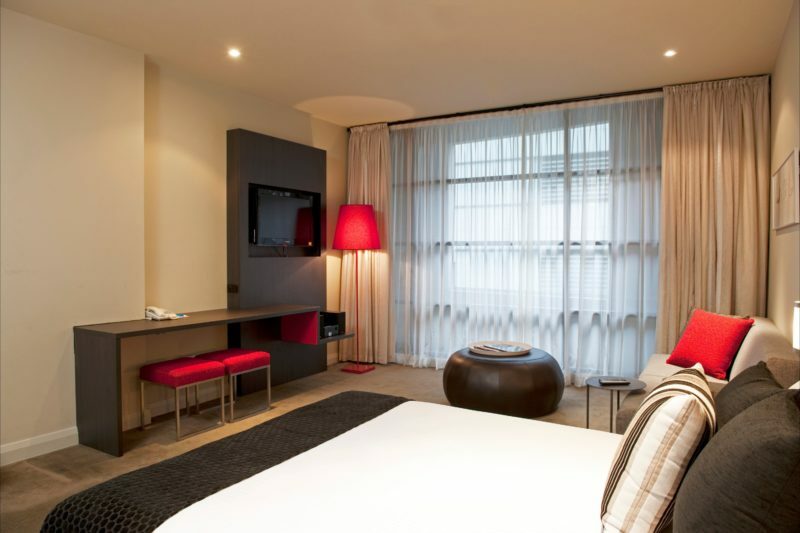 A perfect inner-city hideaway for couples and singles, the One Bedroom Suite offers spacious, comfortable and contemporary accommodation. 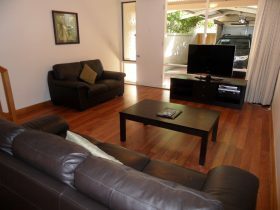 Offering plenty of room for three people, each air-conditioned suite has a master bedroom with queen bed and optional rollaway, and spacious living and dining area with television, Foxtel and CD player. Enjoy speedy internet access, relax on your balcony and cook up breakfast or a light meal in the comfort of your own kitchen. 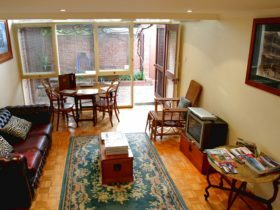 Capture Adelaide’s best attractions with family, friends or colleagues with our Two Bedroom Apartments, the ideal option for up to five people. The apartment features a master queen bedroom with queen bed and a second bedroom with a queen or two single beds. The Two Bedroom apartment features comfortable and stylish surrounds including mini bar, kitchenette, dedicated dining and living areas with Foxtel television and pay-per-view movies.